David Wicks MA thesis project, Drawing Water, links USGS national water consumption data with rainfall data compiled by NOAA/NWS in a series of maps. The data are parsed with Python scripts and the prints (above) were generated using software written on top of a cinder framework. Each line in the prints “corresponds to a daily rainfall measurement. The length of the line and its initial placement are determined by the amount of rainfall measured and where it fell. The final placement and color of each line are determined by the influence of urban water consumers. The more water a city uses, the stronger its pull on the rainfall. As rainfall is pulled farther from where it fell, it changes color from blue to black.” David has also created an interactive version of the map you can view on his site. The lines in David’s maps reveal the degree of difference between where water is used in comparison to where it falls. As we see in the map of the U.S. (top), the consumptive ‘pull’ is so big west of the 100th meridian (John Wesley Powell’s historic delineation of dry lands) that it completely distorts the shape of the continental landmass. The lines show a generalized pattern of consumptive draw, an “as the crow flies” view rather than the convoluted, on-the-ground patterns that such constructed ‘pulls’ tend to take. 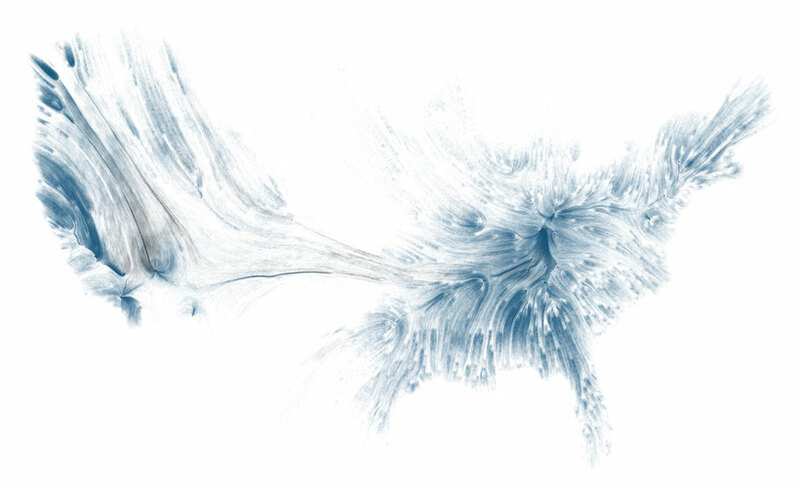 Los Angeles and other thirsty cities, with their networked tentacles of canals, tubes, aqueducts, pump stations, desalination plants and the like, would likely resemble an irregular star-like shape if we mapped their terrestrial hydro-infrastructure. If we were to look at how water is physically moving to where it’s consumed, we would see specific pathways, the unique patterns of inter-basin transfers, like the draw line from Owen’s Lake to L.A., the Canal moving south from the Sacramento Delta. David’s maps are still in development. 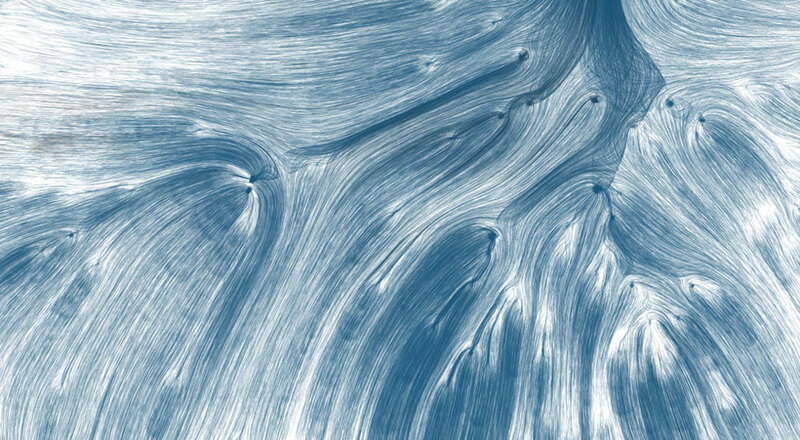 He intends to create more maps with local detail, tinkering with underlying algorithms for motion. He also hopes to perform more time-based scenarios with the data. I am intrigued by the possibilities. Part of my curiosity comes from research I’ve been doing in the Klamath Basin, where the U.S. has been spending over $100 million per year over the past ten years trying to solve the Klamath River’s water crisis. The Klamath is symptomatic of the west’s rivers in general, meaning systemic hydro-alteration combined with over-allocation of water. Who gets use of the Klamath basin’s water has long been contested between farmers, ranchers, Indians, National Wildlife Refuges, and multiple species of endangered fish. Entering the Klamath landscape is like entering a portal into a massive and overwhelming sea of data (for example, try keeping up with all of these, and then try some of these). In trying to fix problems, massive amounts of studies and monitoring are performed. References circulate like mad [i]. Western rivers are ‘drawn’, translated, and exhaustively mapped as much as they are things in themselves. [Water gauge on the Straits canal within the Bureau of Reclamation’s Klamath Project]The USGS provides a map where you can zoom in and see where these guages are located. There are plenty in the Klamath, as well as additional guages by others (again conflict and concern generate added inquiry and data gathering). The Klamath is an a-typical river, sometimes referred to as being upside down. Its deltas, lakes and wetlands occur near its headwaters rather than near its terminus at the sea. Accordingly, the upper basin is highly modified. Most of its wetlands became 210,000 acres of farmland in the early part of the 20th century as part of the Bureau of Reclamation’s first experiments in irrigation urbanism: the Klamath Project. We can see the draws and flows occurring throughout the upper basin. Upstream of the Klamath project we know how much water flows in streams after having irrigated ranch lands. At the upstream extent of the Klamath project we can track the exact storage depth of its main 873,000 acre-feet capacity reservoir, by surface area the largest lake in Oregon. We know how much mountain snowpack can flow into the lake, as well as annual precipitation rates (typically around 13.5″) for the basin’s catchment area of 7,447 square miles. The Bureau of Reclamation continuously tracks exactly how much water is available for its use, and how much water must remain in the reservoir and the river per endangered species act biological opinions. The Bureau of Reclamation knows exactly how much water is flushed into its specialized urban grid made of 1,447 miles of canals, laterals, drains, tunnels and 28 pumping plants. Each farmer, rancher, and National Wildlife Biologist pays per the amount of water they order from the Bureau. The system is just like a city, only the lots are larger, the ratio of human to non human entities is inverted, and the conveyance is more transparent. We can calculate what remains in the river downstream of the Klamath project at multiple locations. Gauges at Iron Gate Dam, the dam furthest downstream of 5 other dams, marks the lower limit of the upper basin. From here the Klamath’s funky water flows unimpeded for over 200 miles to the Pacific Coast. But we can draw the water’s quality as well. We can know what that water contains and its shifting material qualities. PacifiCorp (owner of four of the Klamath dams) must monitor and record water quality data for water within its reservoirs. 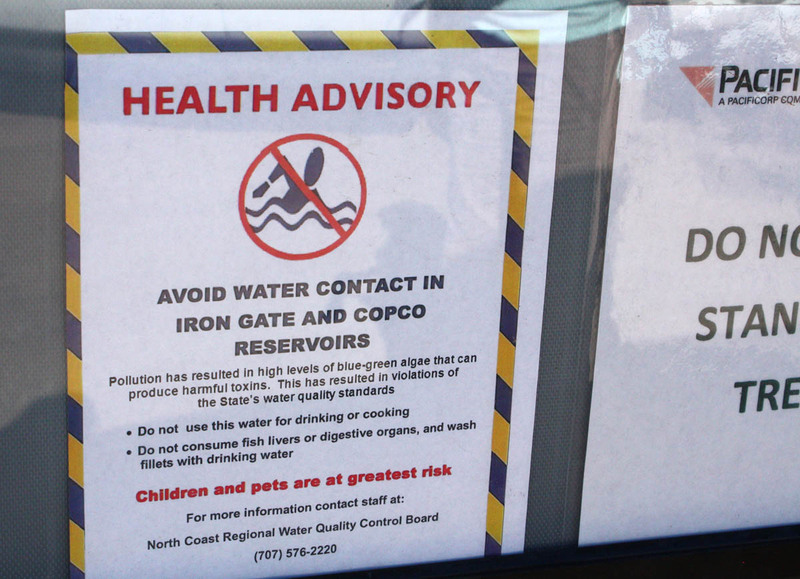 During most summers, as water temperatures rise in the still slack water, thick blooms of cyanobacteria form, which are considered toxic to human health. Once detected by in-stream instruments, public health advisory signs are subsequently posted throughout the area. 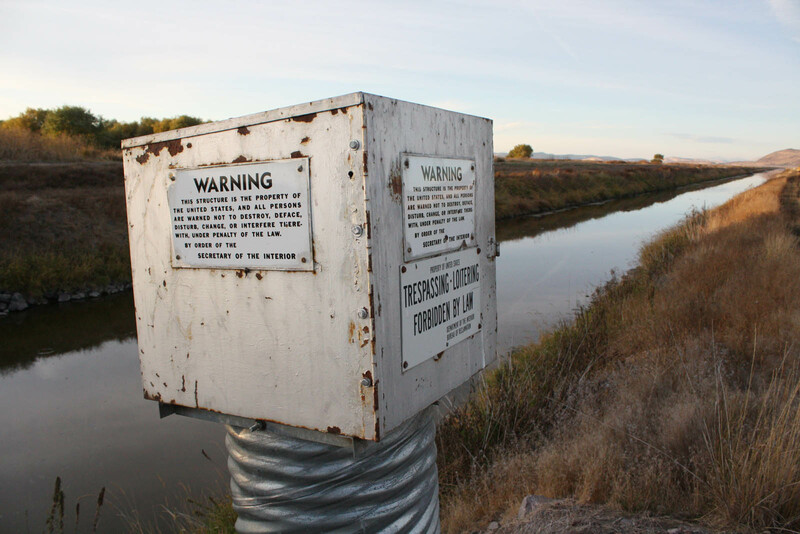 There is also the Klamath Basin Monitoring Program and its Blue Green Algae Tracker, The California Environmental Data Exchange Network (CEDEN), and others. I could continue with this data saturation. There’s much more out there. 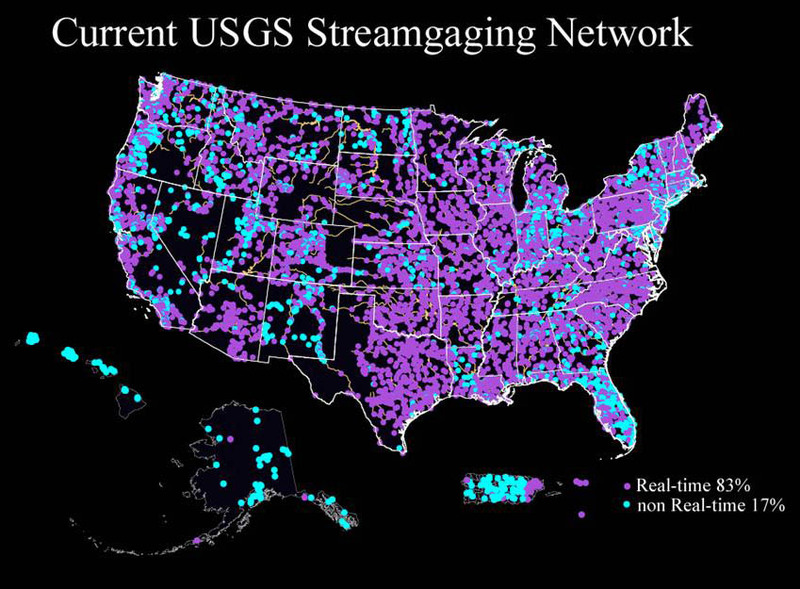 I’m interested in testing if we could build dynamic models that could show the patterns and pulsings of the emergent data streams in contested terrains like the Klamath. As they are now, the data sets are more a disembodied cacophony of bits, rather than something we can perceive as a shifting set of processes. I don’t think building such a model runs a high risk of becoming another totalizing mechanism that serves to become yet another institutionalized instrument of power. Basins and River’s like the Klamath are already deeply there. Rather, such a model might allow us to see some of the associations for any variety of alternative trajectories of connection, exactly that which the Klamath Basin is currently exploring. [i] I refer to circulating reference in the way Bruno Latour used it in his essay of the same name to describe the production of scientific knowledge. In that chapter (in Pandora’s Hope) Latour joins a team of scientists in the Amazon to try to figure out a geo-botanical question: whether a forest is advancing upon a savanna or if the savanna is advancing upon the forest. In his self-described role as anthropologists observing the ethnography of science, he remarks “Knowledge, it seems, does not reside in the face-to-face confrontation of a mind with an object, any more than reference designates a thing by means of a sentence verified by that thing. On the contrary, at every stage we have recognized a common operator, which belongs to matter at one end, to form at the other, and which is separated from the stage that follows it by a gap that no resemblance could fill. The operators are linked in a series that passes across the difference between things and words, and that redistributes these two obsolete fixtures of the philosophy of language: the earth becomes a cardboard cube, words become paper, colors become numbers and so forth…The word “reference” designates the quality of the chain in its entirety…Truth-value circulates here like electricity through a wire, so long as this circuit is not interrupted.” Larval Subjects has an excellent post on Latour’s chapter.